Like to see the UK CVs as more than just sovereign territory (which it still is) but also potential joint allied air bases which the RAAF can't operate from with As. Wasn't that the justification about joint ops when they (brits) switched back to the Bee, or was that just the usual political h*gwash? 3 of the 5 at least show support beyond just words but its a bigger statement than just flying from butterworth. The Brits as you call them (I do not denigrate the UK by using that term as you have) turned back to the F-35B because of several reasons outlined many times in this very thread. And yes other F-35B users such as the USMC are guaranteed to operate from the CVFs as per an agreement (no word about the other Bee user - Italy). Why does any other NON Bee F-35 country need to purchase Bees just to operate from CVF. Best the UK buy sufficient Bees in a timely manner to do so. As I have mentioned many a time on this and other appropriate threads the RAAF need to have a mission for any future BEE squadron ashore when sometimes - IF EVER - they may be needed to operate from our two LHDs. Yes these Bees would exercise on the LHDs as appropriate but spend most of their time ashore. The RAAF have paid only a passing comment about being interested in a future tranche of Bees. These developments are anticipated only in dreams. Where else do aircraft fly from if not from Butterworth? spazsinbad wrote: Why does any other NON Bee F-35 country need to purchase Bees just to operate from CVF. Best the UK buy sufficient Bees in a timely manner to do so. That's the issue. The UK, if its still the UK after brexit, has a big budget gap which raises the possibility of a smaller than 138 B fleet to equip both CVF. I don't see it as other countries buying the B for the sake of operating it from CVF. I see it as buying the B for more basing flexibility which is what the B offers. For those that already intend to buy the A, it becomes a question of whether the incremental cost of a B over an A is worth the basing flexibility. From an FPDA perspective, it makes sense. It means the UK can already base the B from a lot more runways (including land bases and LHDs) than just Butterworth. Even from Singapore, there are double the number of runways that may be too short for As. I believe other unnamed Asian countries that qualify for F-35B use should step up - Australia already has 5gen abuilding. spazsinbad wrote: I believe other unnamed Asian countries that qualify for F-35B use should step up - Australia already has 5gen abuilding. RAIN to smooth out the stealth quicker eh. And another uplifter or down with the other one on top. JPGs via e-mail. "The multi-million-pound contract signed will see the UK own 35 stealth jets by end of 2022 with Britain manufacturing 15% of the overall global order for 255 aircraft. The UK is set to double its number of world-beating F-35 stealth jets after ordering 17 more aircraft, Defence Secretary Gavin Williamson has announced. The 17 new F-35B aircraft will be delivered between 2020 and 2022 and will complement the 16 British aircraft currently based at RAF Marham and in the US, as well as two additional aircraft which are already on order. Overall, the UK has committed to procure 138 aircraft over the life of the programme…." 2 F-35B in LRIP run 3, 1 F-35B in LRIP run 4, 1 F-35B in LRIP run 7, 4 F-35B in LRIP run 8, 6 F-35B in LRIP run 9, 3 F-35B in LRIP run 10, 2 F-35B in LRIP run 11, 2 F-35B in LRIP run 12, 6 F-35B in LRIP run 13, 8 F-35B in LRIP run 14 and 7 F-35B in LRIP run 15. This brings us to 42 in 2023. The next run brings us to the total of the first batch of aircraft, 48." "The UK is likely to decide on the final composition of its Lockheed Martin F-35 Lightning force at the next Strategic Defence and Security Review (SDSR) expected in 2020, a senior military official said on 14 November. Speaking at the IQPC International Fighter Conference in Berlin, Air Commodore David Bradshaw, Lightning Force Commander and Tornado Force Commander, said that, while no official announcement has been made, it is his opinion that the Ministry of Defence (MoD) will use the SDSR to decide if the UK will continue to buy the short take-off and vertical landing (STOVL) F-35B to add to the 48 already procured, or if it will instead decide to fulfil its outstanding commitment of 90 aircraft with the conventional take-off and landing (CTOL) F-35A. "The next SDSR defence review, whenever that might be, is when I would expect a decision to be made, but it is something that we can't leave for too long as the programme begins to ramp up as we move on from the initial 48 [STOVL] aircraft," Air Cdr Bradshaw told Jane's . While based out of Royal Air Force (RAF) Marham in southern England, the UK's Lightning fleet is currently owned and operated by the RAF and the Royal Navy (RN) with pilots and maintainers from both services set to field the aircraft from land bases and aboard the two new Queen Elizabeth aircraft carriers as a joint force. Air Cdre Bradshaw was unsure what effect procuring the land-based F-35A might have on this joint concept of operations, but he did note that there should be no reason to transfer the F-35Bs solely to the RN as the flexibility the aircraft provides is also of value to the RAF. 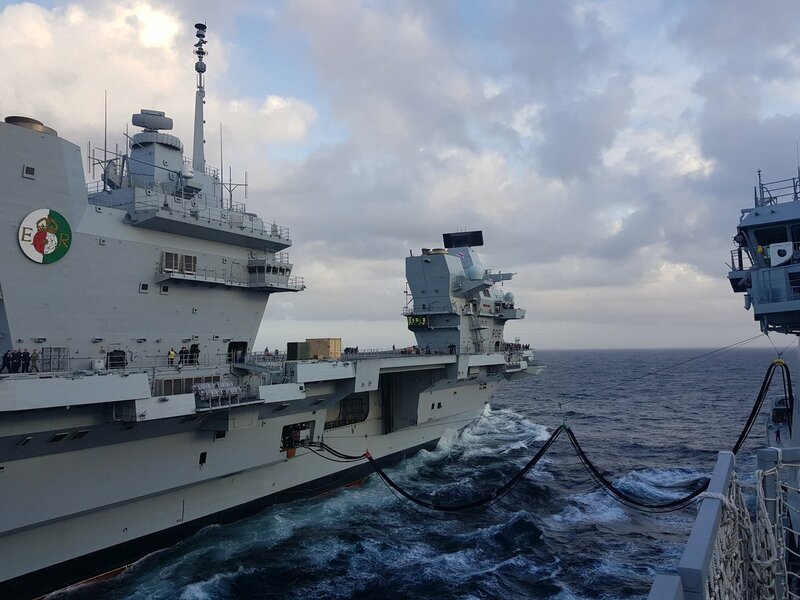 Caption Text: "With the UK committed to 138 F-35s, it has so far ordered 48 F-35Bs for the Queen Elizabeth-class aircraft carriers. While it has yet to decide if the remainder will be A- or B-variant, the commander of the Lightning Force told that the flexibility of the STOVL F-35B is also of value for land-based operations as the aircraft can and will be flown from 'off-strip' locations." As long as the Brits are serving beer or ale on the Lizzie and Prince, they'll have no problem with USMC jarheads showing up. So I suppose they could get away with 48 Bees, and just make up any shortfall with USMC drop-ins. The 17 doesn't ties to run 12-14 in the quote. Run 11 = 1B and run 12 = 3B to tie.